Rogue One Reactions! The first Star Wars stand alone film, Rogue One: A Star Wars Story has hit theaters and Chris, Ben, Dominic, and Zac share their immediate reaction to the film (including some in the theater thoughts). 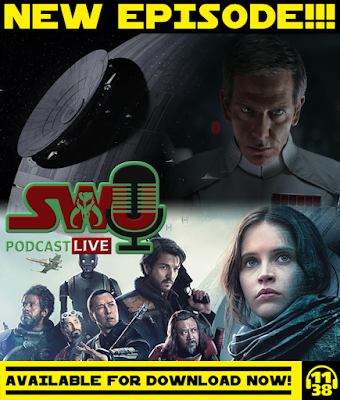 They talk about favorite moments, favorite characters, Darth Vader, and the lack of crawl. Plus how this affects the order to watch the films, how do certain characters look, and the ending. All this and much more! Rogue One is a success. Great characters, EPIC battles. An actual war movie, pushing open the limits of what Star Wars films can be. My only criticism is of 2 specific CGI human characters. You will understand who they are after seeing the film. They took me out of the moment at every appearance. It looked jarringly fake. It felt fake. Contrasted against a gritty and in-the-moment film, took me out of it each time. Both of these CGI characters would have been better handled seen only once each and from behind only. The 1st character was initially seen in a reflection. That should have been it, then maybe through hologram communication.. But these CGI moments only make what could have been an "A" a strong "-A." 1. Urso Home, first scene where they are packing: Note the reference to the "Famous" Blue milk on the table! 3. Gold Leader and Red Leaders cameo's in the space battle! And then the death of Red 5, whom Luke then replaced as Red 5 in the battle for Yavin! 4. The return of multi-ship space battles! Y-wings! This was a bit of a downer for me on TFA, only x-wings!? Really? THere are hundreds more but such a great movie for the fans. Everyone is apposed to the CGI characters, I really did not mind this, for me it was personally just wonderful to see how far we have come to be able to do this, I did not watch this on a particularly big screen so you could hardly notice the CGI, fantastic attempt and well worth the credit!